Cuba and U.S. meet to negotiate property claims. 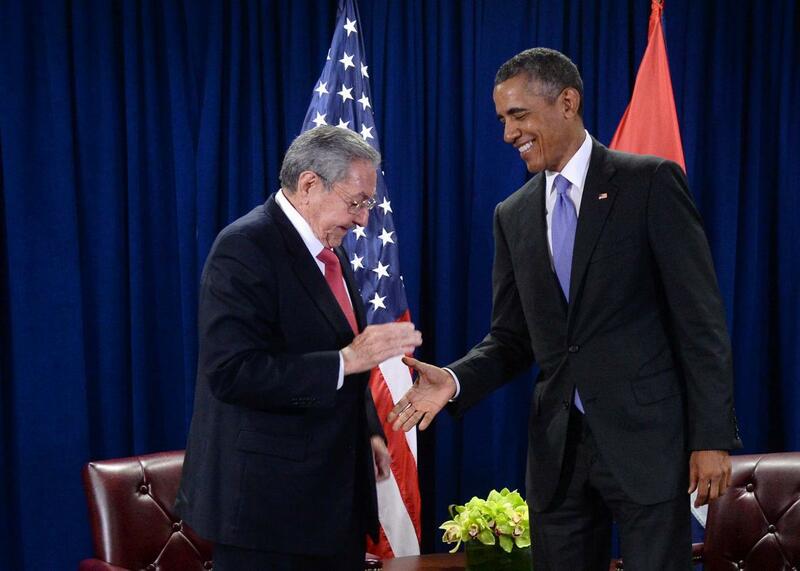 U.S. President Barack Obama and President Raúl Castro of Cuba shake hands during a bilateral meeting at the United Nations Headquarters on Sept. 29, 2015. The U.S. State Department meets with the Cuban government Tuesday to begin official negotiations over outstanding claims of American individuals and corporations who fled Cuba during the Cuban revolution and whose property was seized by the Castro regime. Settling the claims is a vital precursor to lifting the U.S.-imposed trade embargo and to fully normalizing relations between the two countries. The roughly 6,000 claims were valued at $1.9 billion in the 1960s. The bulk of the claims belong to individuals (houses, land, securities that were held in Cuban banks), but the highest-value claims mostly reside on the ledger sheets of companies like Coca-Cola, IBM, and Starwood Hotels. For more detail on the claims—including an interview with a claimant, a look at some shady speculation and trafficking in the claims over the years, and what shape a resolution might take—read my November Slate story. Despite the distance between the negotiating partners, both sides have a real interest in getting this done, and a framework for a claims settlement might be nailed down as soon as 2016. Many observers believe President Obama craves a Cuba opening as part of his legacy, and there’s uncertainty over how the process might turn if a Republican president is elected in November. For individual claimants, a settlement might produce a windfall. For Cuba, a settlement might be one element of a grand bargain with the U.S.—including a wave of new American investment and development aid, and a radical transformation of the foundering Cuban economy.